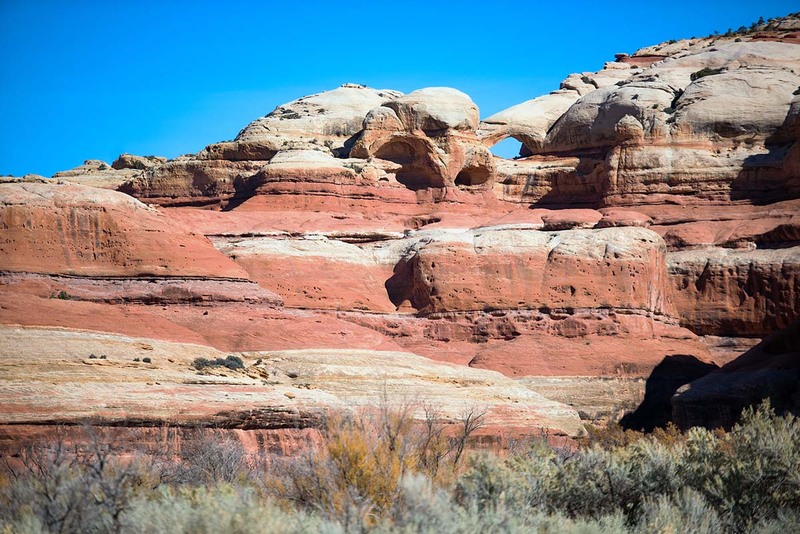 Tracing canyon bottoms and following passageways carved by water and time, Utah’s trails meander across the state, connecting one dramatic landscape to the next. They are neither blazed with pickaxe nor dictated by man, but spun by the earth herself. 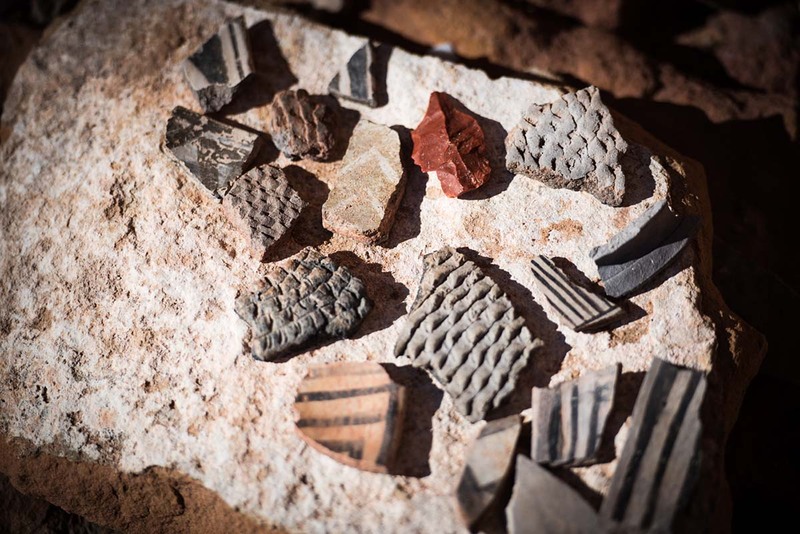 To explore the red canyons and wide-open mesas is to walk in the footsteps of the ancient civilizations that inhabited them. Each mile highlights thousands, or even millions, of years of human and geologic history. And at the heart of this natural time machine is Salt Creek Canyon. Two years ago, my father Kurt retired. After 35 years at the same job, he was at last poised to live out his ultimate dream of freedom on the open road. This would be his new way of life, not merely a weekend escape or a vacation getaway. My stepmother, Bahyoe, gave my father a “solo year” before she also retired, hoping (as she readily admitted to me) he “would get it out of his system.” Deep down, though, I think Bahyoe knew nothing was about to stop my old man and that she’d eventually be along for the ride. Time has proven this to be true. Catching up with my parents these days—and my dad in particular—is akin to spotting an endangered species. He is a man on a mission. So when I was finally able to track my folks down and corral them into a backpacking trip, I was ecstatic. 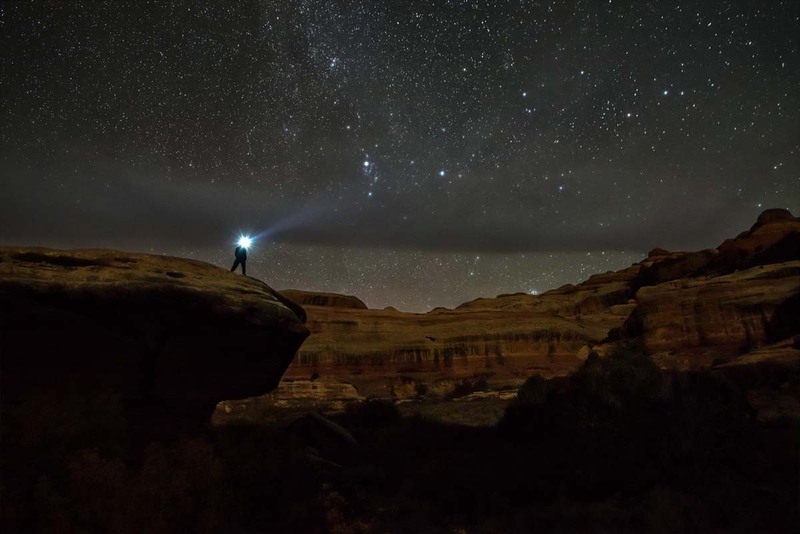 I’d been to Canyonlands a few times in the past, but due to unavailability of permits and limited time, overnighting in its wilderness had eluded me. This year, fortune favored the persistent. We scored permits for the hike and snagged the very last campsite at Squaw Flat Campground—one of the best car-camping sites I’ve ever seen—for our first night in the park. It’s no small journey to get here. 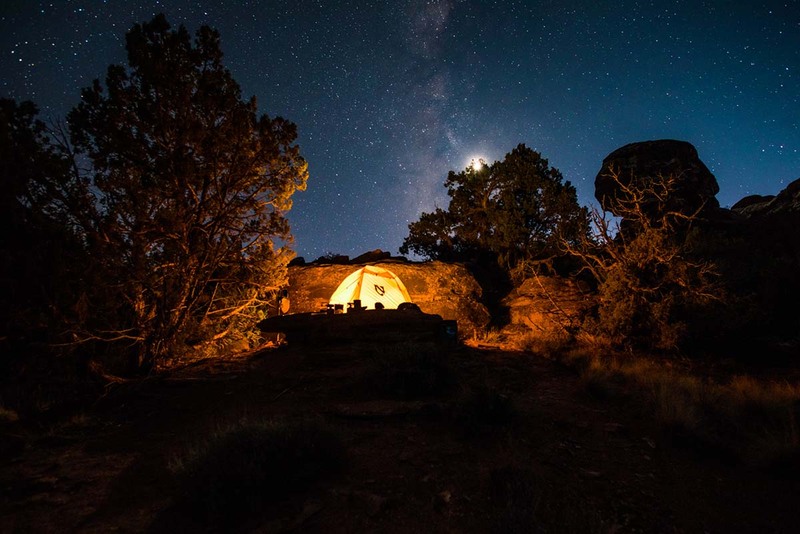 Canyonlands is a four-hour drive from the closest major airport, but the distance makes arrival here all the sweeter. On our first night, we scrambled atop the red rock bluffs overlooking the campground and watched the sunset melt into far-off mesas. Sitting with cold beers, we stared into the vibrant landscape of our future journey, rife with ridgelines and canyons to explore. 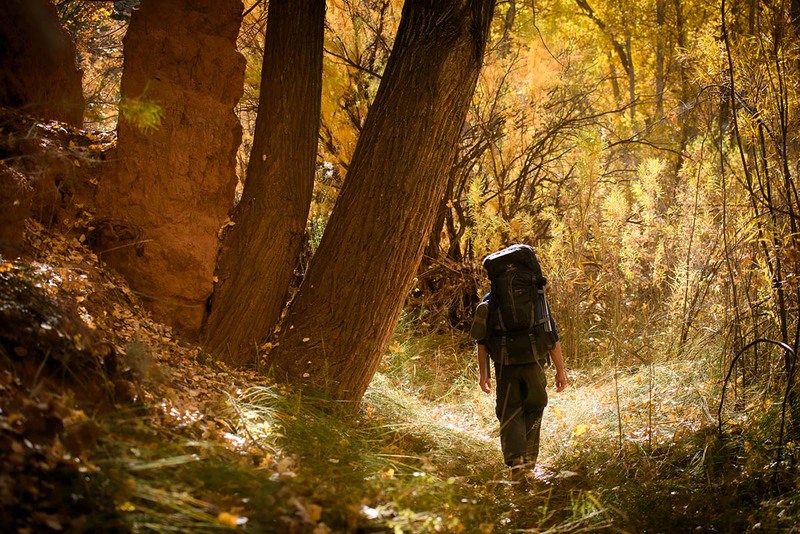 Our plan was to backpack four days along Salt Creek Canyon. From Squaw Flat Campground, we left one car (as this is where our trail would end) and drove the other out of the park, along Beef Basin Road, though the climber’s mecca of Indian Creek, and past the Abajo Mountains. 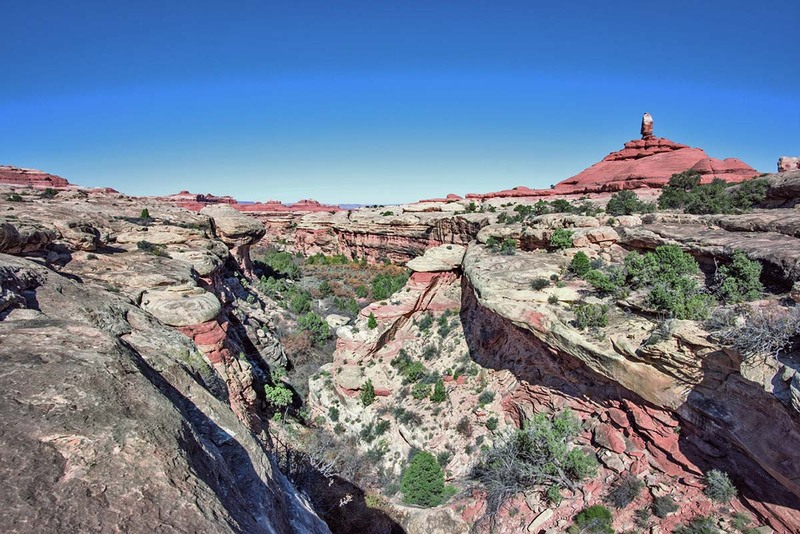 Eventually, we reached the southern boundary of Canyonlands National Park, arriving at the Cathedral Butte Trailhead. 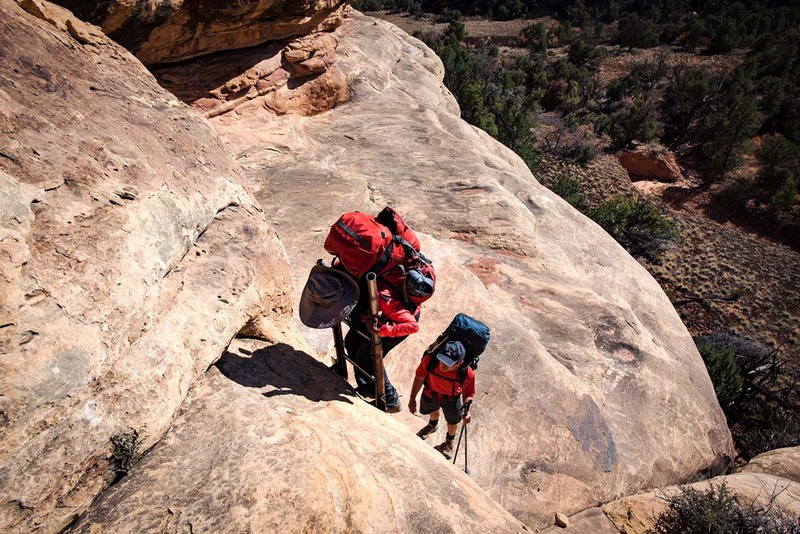 With our packs on, we descended a loose rock trail roughly 1,000 feet to the canyon floor—the beginnings of Salt Creek Canyon. We spent our first night just over four miles into Salt Creek Canyon. Before reaching camp, we stumbled upon Kirk’s Cabin, built sometime in the late 1800s and in surprisingly fair condition for its age. After exploring its nooks and crannies, we filled a dromedary bag with a gallon and a half of water from a nearby spring and walked the short distance to the established campsite SC2. That night we stargazed from high cliffs, just like the previous evening and those yet to come. Day two began at the crack of dawn, with the sun bursting over the canyon rim. We continued 11 miles to the overnight zone near Angel Arch (where camping is not confined to an established site). The early wake-up gave us extra hours to explore. That said, if I were to do it again, I would stay the second night at SC3 (mile 9.1). This stretch of trail is worth far more exploration than one day can supply. As we passed through the weathered fence near Kirk’s Cabin, I gazed back and saw Kirk Arch, the first of many towering, weather-carved features. Wedding Ring, Fisheye, Crescent, and Angel arches were yet to come. 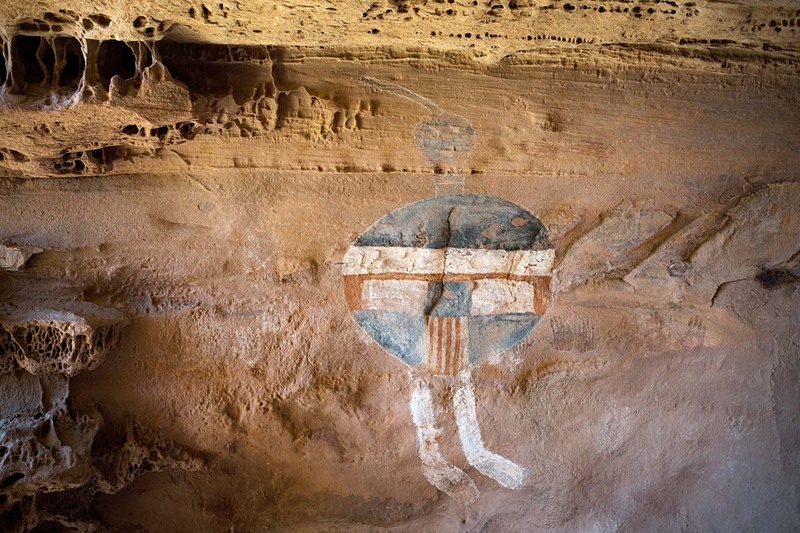 We soon arrived at a red, white, and blue pictograph drawn into a canyon wall along the side of the trail. Until recently, this relic was considered a fake for many reasons, including its similarity to the United States flag. However, the ironically named “All American Man” was recently carbon-dated to the 1400s and confirmed to be an Aztec pictograph. 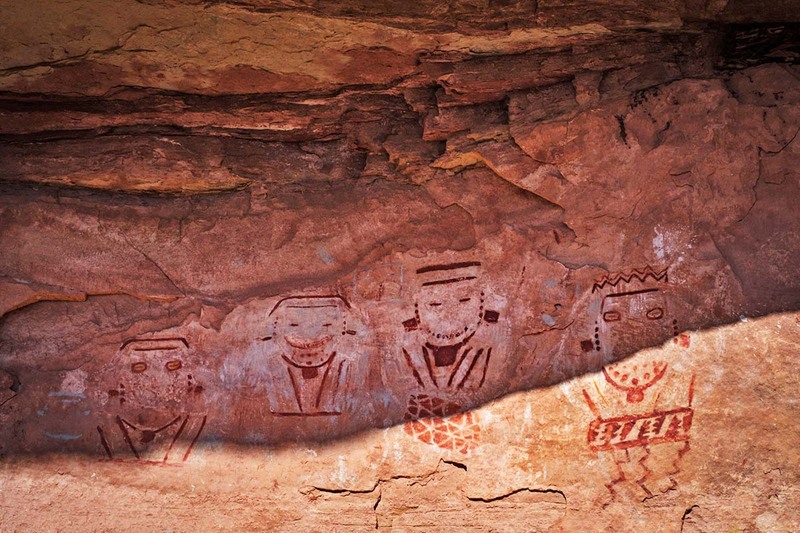 As we continued, we found more pictographs and hidden cliff dwellings up nearly every canyon. For the second night, we pitched our tent in the dispersed camping area a few hundred feet above the canyon and a short distance beyond Angel Arch trail. Throughout this zone, a fire caused by careless campers left juniper trees bare and blackened, and rock cracked and covered in soot. The anger I felt at this loss was quickly assuaged by the views a short distance above the destruction. From high above, the breadth of the canyon became visible, torso to limbs. Perched on the smooth orange rock, we watched as the canvas of sandstone and sagebrush melted into darkness. The final day led us to the end of Salt Creek Canyon into an entirely different landscape. At Peekaboo Camp (22.5 miles), canyon depths transition to red and white canyon rims. At this point, we encountered a ladder—an obstacle Bahyoe was less than thrilled to tackle as we hadn’t prepared her for this part. Whether consciously or subconsciously, my dad and I knew that her fear of heights wouldn’t be pacified by advanced disclosure. While her discomfort continued throughout the remainder of the hike, my father and I felt like we’d encountered paradise. The trail weaved over smooth slabs of sandstone, only cairns marking the way. These piles of broken rock led us along ledges, over mesas, and even through a cave from one side of the mesa to another. Near the end of the hike, we ascended the last ladder ten feet to a precipitous ledge. I thought my stepmom was going to keel over from fear. Her eyes closed, my dad and I led Bahyoe through the worst of the exposed terrain. 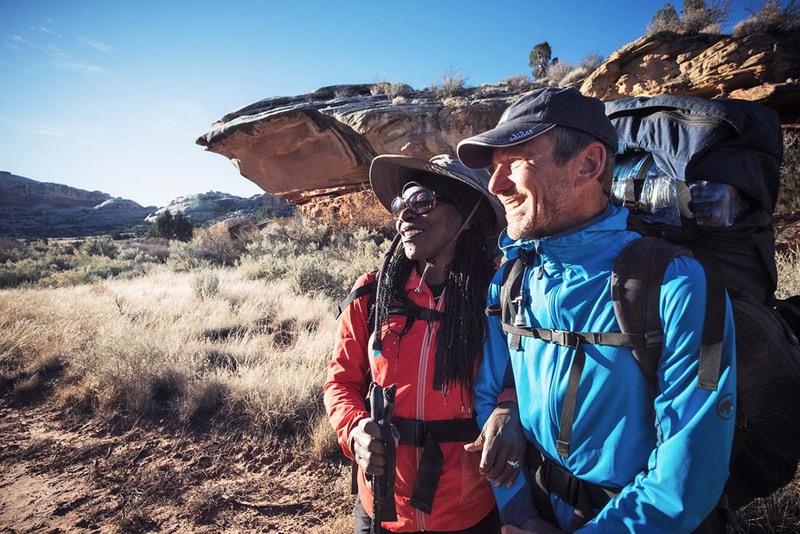 I started to feel guilty for bringing her into such a challenging situation, but as we crossed the last few easy miles across Squaw Flat, the feeling subsided. 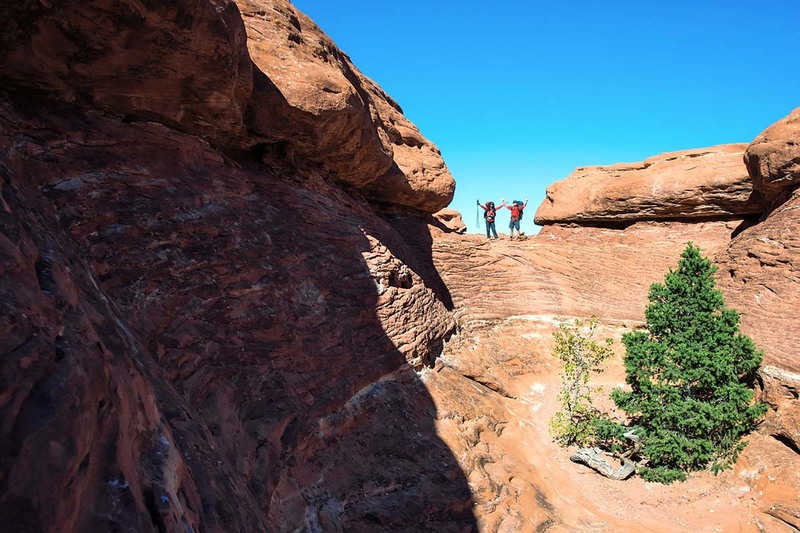 It is a rare gift to have parents willing to hike through Canyonlands with their adult son. If I have to cajole, lie, and guilt my way into easing them onward, I’ll do it. Besides, as my old man would spiritedly agree, nothing should get in the way of a good adventure. Within Utah’s vast reserves are five national parks, each a unique masterwork that exemplifies the best natural beauty the country has to offer. 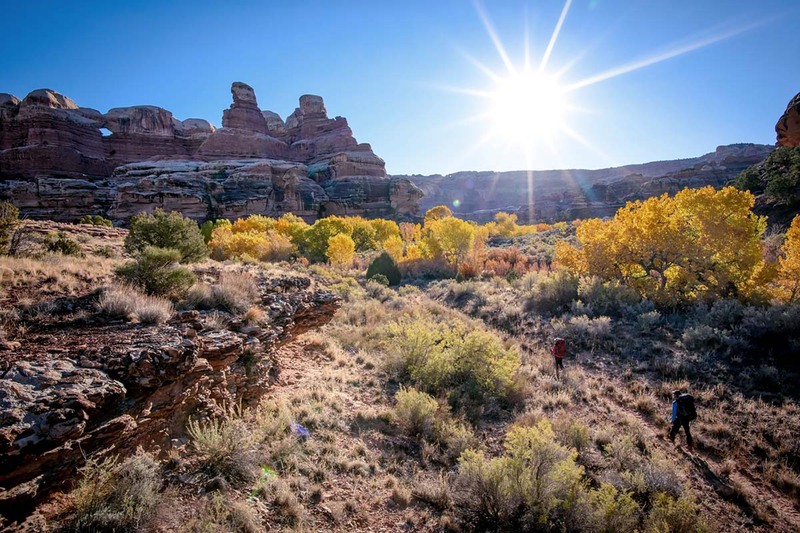 Salt Creek Canyon lies within one of those parks—Canyonlands—the largest in Utah. 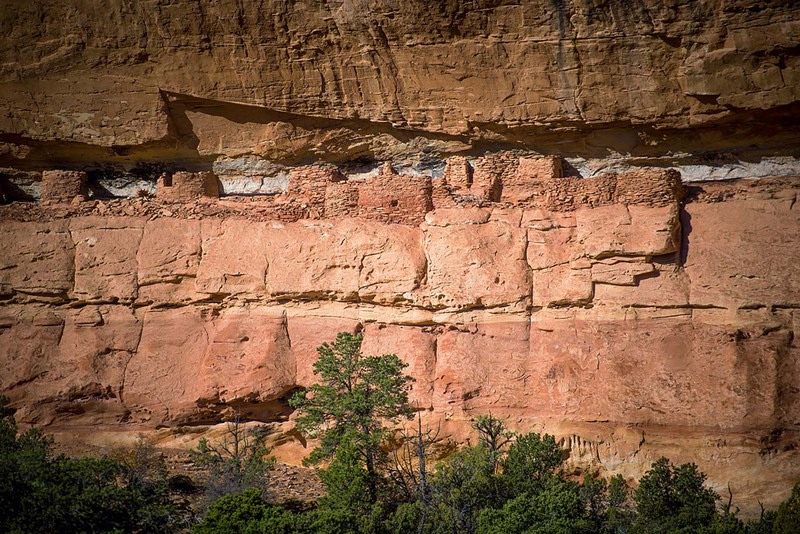 Covering well over 300,000 acres, this wilderness playground is a wonderland of canyons, towers, hoodoos, arches, mesas, and ancient pueblos. And while Canyonlands National Park is the largest in Utah, it isn’t the most visited—both Zion and Arches get more people. 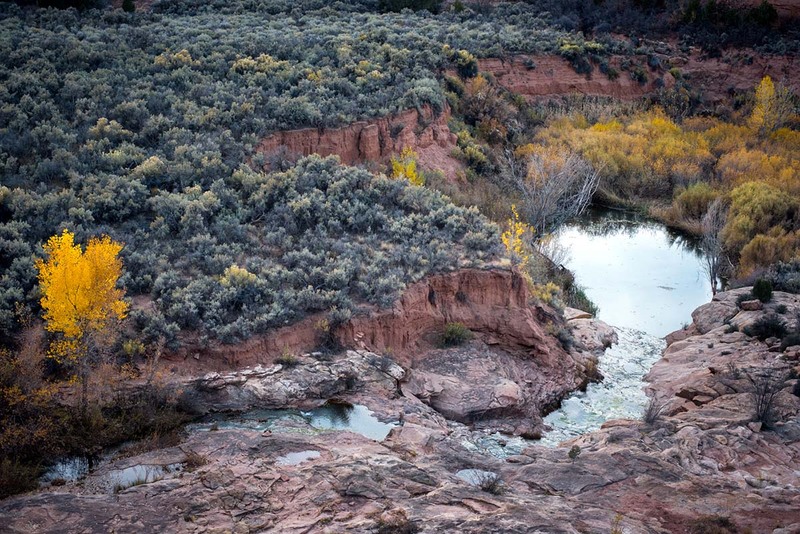 Near the center of the park lies the convergence of two of the West’s great rivers: the Green and the Colorado. These meandering serpents create a ‘Y’ that forms the boundaries of the park’s so-called districts. 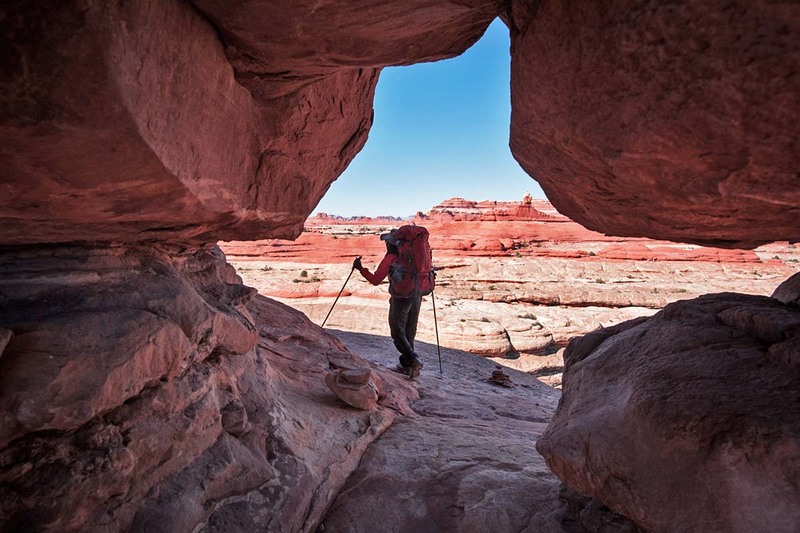 To the north is Island in the Sky, where car-accessed viewpoints abound and the famous 100-mile White Rim Trail begins. 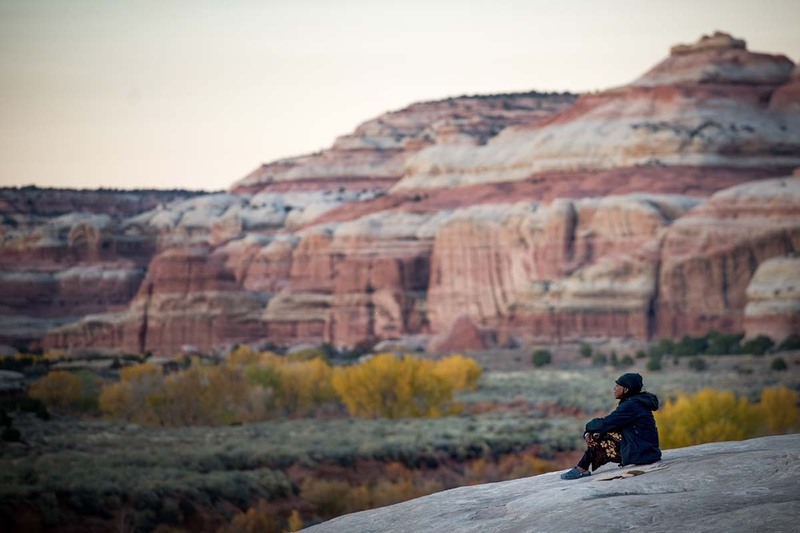 Island in the Sky sees 77 percent of Canyonlands’ visitors, while the other two districts remain relatively quiet. To the west of the confluence is the Maze, a shattered land so rugged that it was among the last places mapped in the country. And to the southeast lies the Needles, where intrepid backpackers will find Salt Creek Canyon. 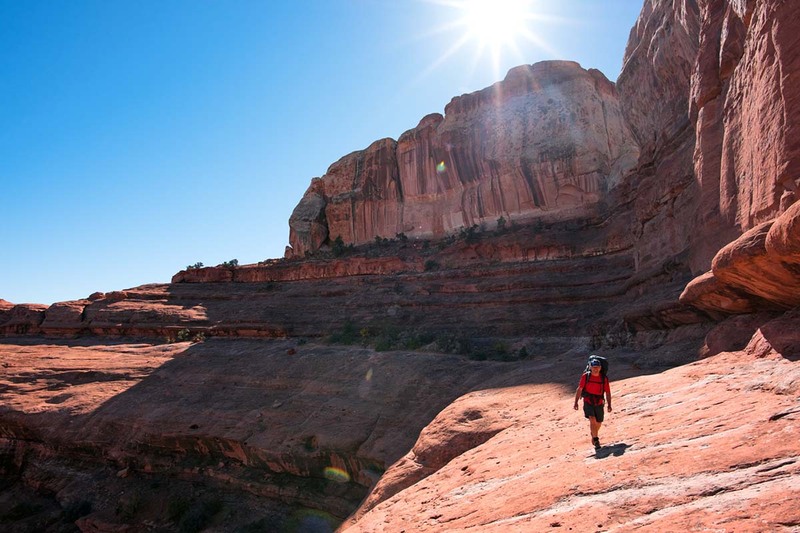 In the southeast corner of Utah, Canyonlands lies west of highway 191 near the town of Moab. 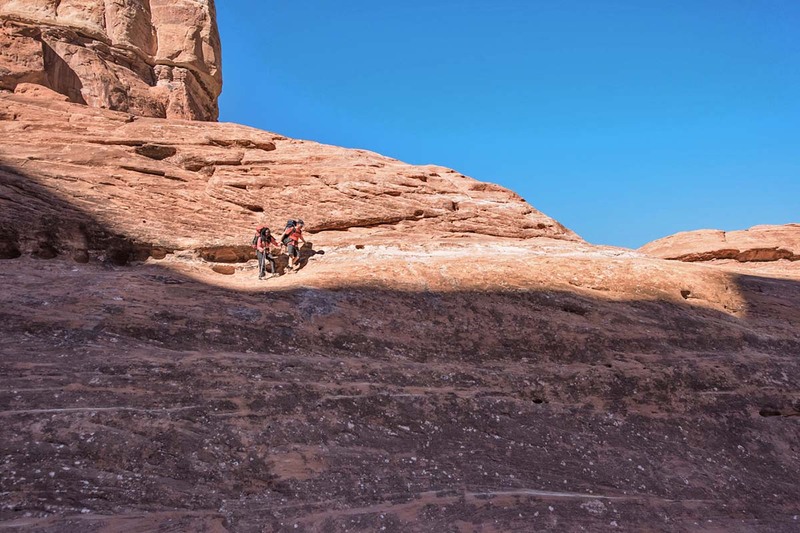 To reach the Needles District, continue west on 191, past Moab, and take a right onto Highway 211 (south of Moab by 38.5 miles and north of Monticello by 13.5 miles). Continue to Beef Basin Road (20.2 miles). This is the junction between the two trailheads (Squaw Flat Trailhead and Cathedral Butte Trailhead) of the one-way Salt Creek Canyon hike. Decide which way you’d like to hike the trail and plant a shuttle car accordingly. 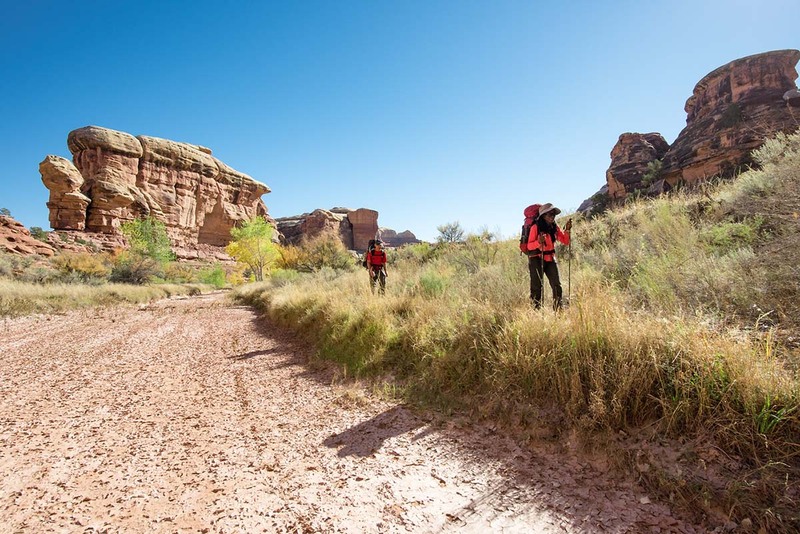 Additionally, some guide companies in Moab offer a shuttle service between the two trailheads. To get to Squaw Flat Trailhead, continue 36 miles on Highway 211 to Squaw Creek Campground, following signs to Loop A. The trailhead will be located on the left and is well marked. To get to Cathedral Butte Trailhead, head left on Beef Basin Road and zero your odometer. Continue 17.2 miles to the parking for Cathedral Butte. The trailhead isn’t marked on the road, but you’ll be able to make out an informational sign in the parking area. Beef Basin Road is generally accessible by 2WD vehicles, though it is important to know that rain can significantly change its nature. Be sure to check the road conditions on the national park website before you head in (cell service is not available within the park or along Beef Basin Road). Conditions change year to year and are both dependent on weather and on when the road has last been graded. The Needles Ranger Station is located on Highway 211, a few miles before the Squaw Creek Campground. You can secure the required permits here, unless you’ve already visited one of the other ranger stations in the park. Limited overnight use is allowed in Salt Creek Canyon by permits secured online, between four months and two days before your trip. Camping in the Needles is very busy in the spring so securing a permit well ahead of time is recommended. Autumn is less busy but steadily gaining popularity. If you’re lucky, you can obtain permits in person at the Needles Ranger Station, either the day before or the day of your hike, and no less than an hour before the visitor center closes. When applying for a permit, you’ll be asked to specify your itinerary (where you will stay each night). For reference, there are four established campsites: SC1 and SC2 (mile 4.3), SC3 (9.1 miles), and SC4 (12.4). Between Angel Arch (mile 15) and Peekaboo Camp (mile 22.5), “at large” camping is allowed. As long as you are at least a mile from the road and more than 300 feet from water or archeological sites, you can camp anywhere. Camping also is available at Peekaboo Camp (22.5 miles). Other campsites exist on or near the Peekaboo Trail and allow for extending your trip or deviating from the standard route. Note that if you have an “at large” camping zone on your itinerary, you must obtain a signed permit at the ranger station and carry it at all times. 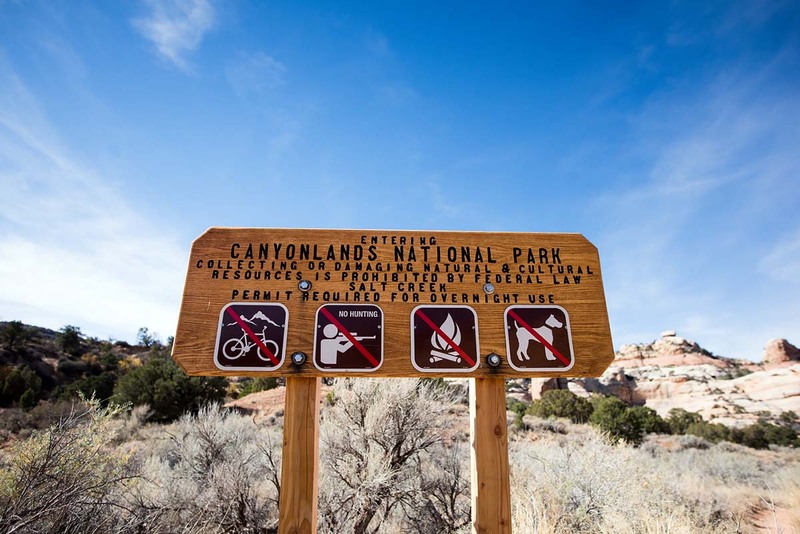 There are no fires, pets, hunting, or bikes allowed in the backcountry of Canyonlands National Park. You’ll also pay a backcountry camping fee for the Needles district, $30 and good for up to seven people. Canyonlands National Park is a desert, and depending on the time of year, water is limited throughout Salt Creek Canyon. A perennial flow is historically available in a handful of locations (the best being near the established campsites), but oftentimes hikers will need to carry enough for the day or even the entire trip. When you see running water, it’s a good idea to fill up, especially to avoid having to drink from unappetizing water sources rife with frog eggs or mud. We found a high-capacity dromedary to be essential, and it can be helpful to bring an additional bucket for letting sediment settle, as well as a backup filter and/or water purification tablets. For more information, see our article on water filters and purifiers for backpacking. Water shortage, minor route issues, ladders, ledges, and loose rock are the primary difficulties on the Salt Creek Canyon trail. By and large the trail is flat, except for the beginning and the end. There is a 1,000-foot descent from the Cathedral Butte trailhead to the canyon head on one end; at the other, a 1,000-foot climb from Peekaboo Camp to Squaw Flat. Some people will find trekking poles useful. Nearing Squaw Flat, there are several ladders and narrow ledges along the canyon rim. If you have a fear of heights, this portion of the hike will be your least favorite. Along the canyon bottom, hikers can easily lose the trail in overgrown sections. That said, we found these spots to be well-flagged, so just be wary when the trail grows thin. Don’t stubbornly continue into overgrown brush. Retrace your steps to where you were last on the trail and search for cairns and established paths from there. 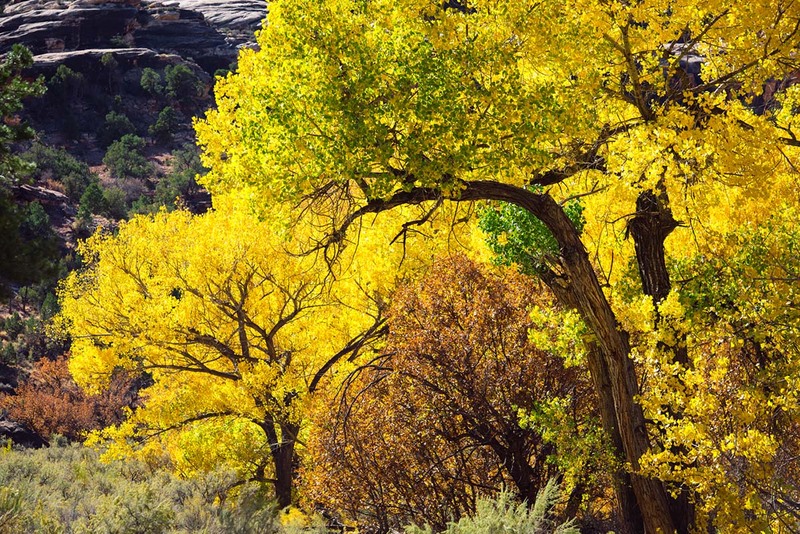 The best time to hike Salt Creek Canyon is spring or fall—temperatures during these months are mild. As a result, they are the busiest seasons in the park. I don’t recommend hiking during the summer heat in Canyonlands, especially as water is difficult to find along the trail. 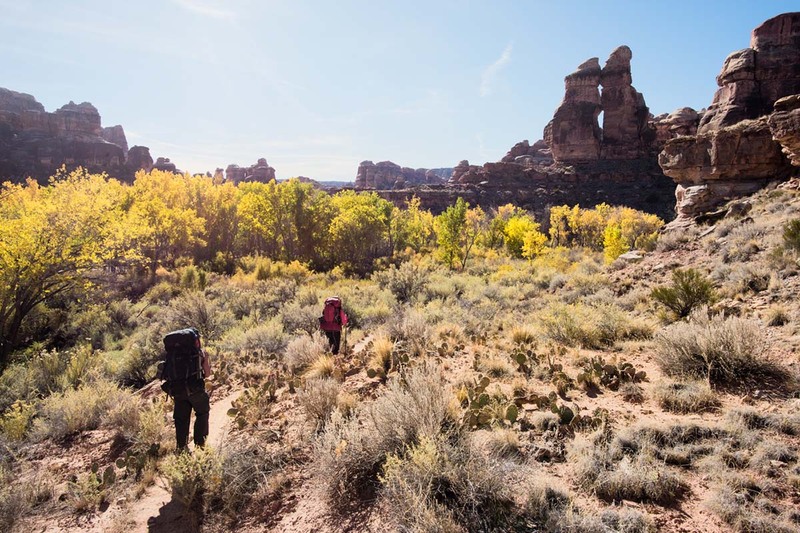 For hardy backpackers, the winter months are feasible, though it’s important to remember that days are short, nights are very cold, and fires are not permitted in the backcountry. 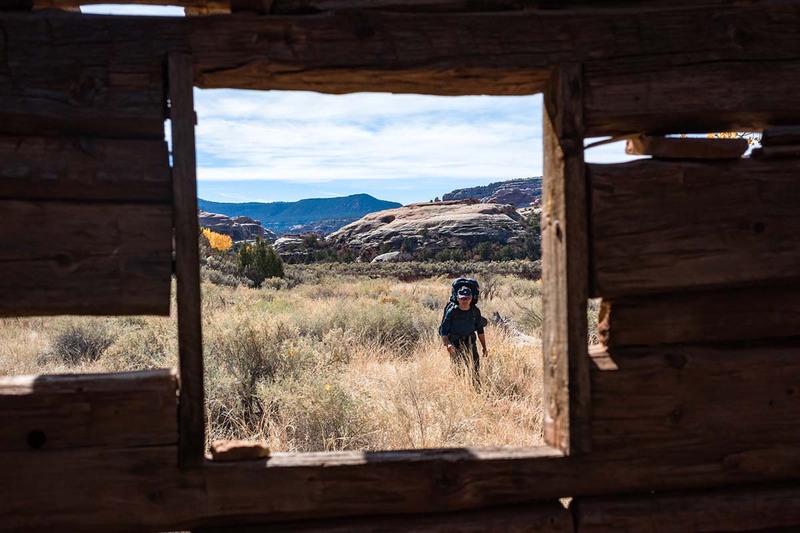 The high rock walls, arches, and ruins found within Salt Creek Canyon are just one small piece of Utah’s grandeur. But unlike precious artifacts, our country’s natural treasures aren’t hidden behind glass or ropes. Instead, they’re available to be felt and experienced by all. And to whom much is given, much is required. It is our responsibility to keep these areas protected and tread lightly when we visit. We have conservationists like Roosevelt to thank for these landscapes, people who gave us perhaps the greatest gift we’ll ever receive: public, wild places preserved for our enjoyment. More, we are indebted to the many native civilizations that inhabited these areas without disrupting the natural way of things. Their practices and lifestyles were guided by respect and gentleness, and we still have much to learn from them about what it means to have healthy relationship with wilderness. I’m grateful for Salt Creek Canyon and all of Utah’s public land. It is my hope that those of us who visit only bring this landscape closer to its most natural and healthy state. May it be a place where people can walk ancient pathways, connect with friends and family, and fall in love with nature all over again.